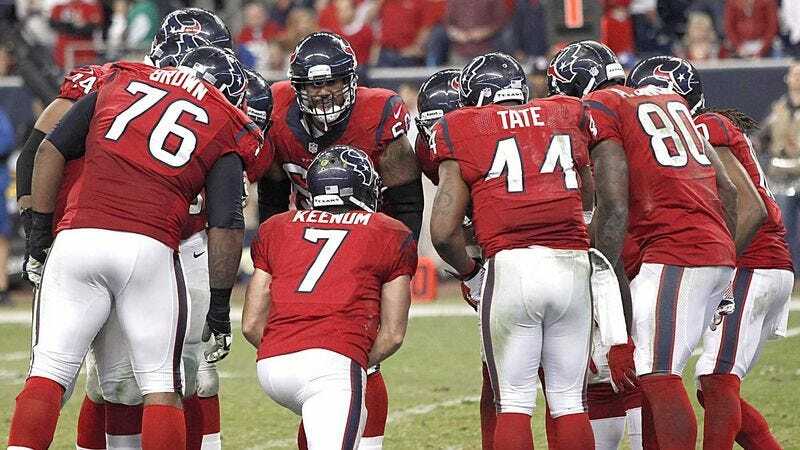 HOUSTON—With their longtime coach just released from the hospital after collapsing during Sunday night’s game, members of the Houston Texans admitted to reporters Tuesday that they just wished the team was good enough to make a spirited on-field rally for Gary Kubiak. “We all love Coach, and don’t get me wrong, we want to go out there and win to lift his spirits so he can make a quicker recovery, but we can’t do it,” said Texans defensive end J.J. Watt, noting that while dedicating a huge victory to Kubiak “would be great,” the team is realistic about their chances after starting the season 2-6 and blowing an 18-point lead against Indianapolis last weekend. “If we were a little healthier and had a better passing game, then yeah, maybe we could come together and turn the season around for Coach Kubiak. But for now, pretty much the only thing we’re capable of is visiting him at home and playing with a ‘GK’ decal on our helmets. That’s about it.” Many players later confirmed that they might inspire Kubiak with a strong, hard-fought win in the team’s Nov. 24 game against the Jaguars.